Integrating Google Assistant with Internet of Things can make our IOT based devices more smarter. It gives voice to our IOT devices with the power of Artificial Intelligence, Natural language understanding & many more. In this tutorial i will give overview of all steps we need to follow for creating IOT based device that can be controlled via Google Assistant. What different from other posts on Internet ? 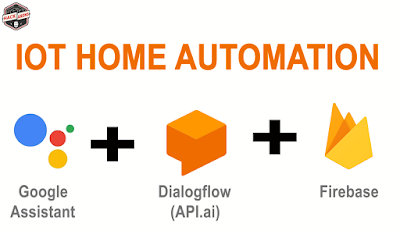 On Internet you can find many tutorials which shows IOT home automation using google assistant but most of them uses private vendor Apps & APIs like Adafruit, Blynk, IFTTT. All stated above have some basic functionality only, here we can't customize our chat bot (to be integrated in Google Assistant) according to our requirements. In our project we are using Google Firebase, Dialogflow & actions on Google. Best thing here is all 3 are Google products, using Dialogflow we can customize our chat bot according to our needs. Additionally there is no need to create a android app, we can directly use android device google assistant to control smart device. Connect Arduino D2 pin to relay input, Arduino 5 VCC & GND to relay VCC & GND respectively. Do other connections exactly as shown in diagram given below. For connecting arduino nodemcu with firebase realtime database we need to use Firebase Arduino Library, setting up this library has been done in previous tutorial check out here. Go to https://dialogflow.com/ and login with same credentials you are using for firebase console. 1. Create a New agent : Type agent name and click create button. 2. Go to Entities Tab : Here need to create 2 custom entities, 1 for lights off and other for light on. 3. Now we are done with setting up custom entities, Let's create an Intent - Go to Intent Tab & click create Intent button. Now Go to training phrases option and type given below phrases. Tip : More Training Phrases you type, more intelligent you chat bot will be. Now at bottom you will find Fulfillment option, here choose enable web-hook call for this intent. 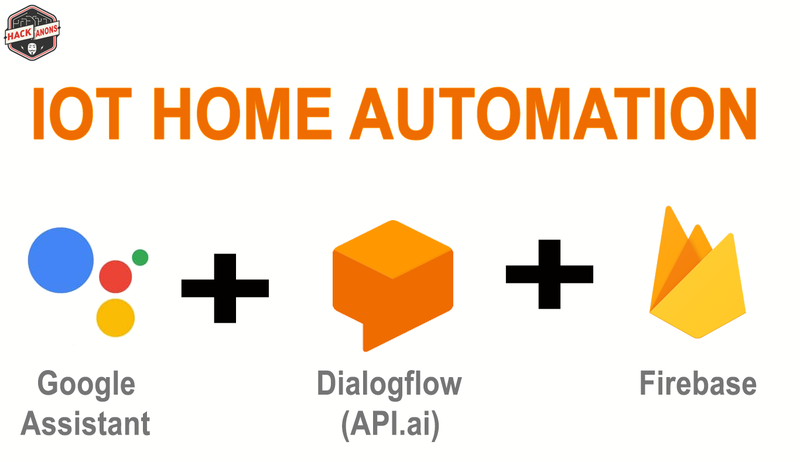 That's it we are done with setting up Dialogflow agent, click on save button and start training your agent, once agent training completed we need to switch to fulfillment tab. Let's cover Fulfillment and Firebase tools part in next Post. If you guy's facing any issue feel free to comment out, i will try to sort it out as soon as possible. is it will reconnect again and again if wifi off and on after? Can this be done using an Arduino Uno or Nano as well? If so, what are the changes that should be made to the code? can this be ON and OFF with a single entity name like switch and dialog like switch on, switch off? Nice project, can you post for multiple device control?